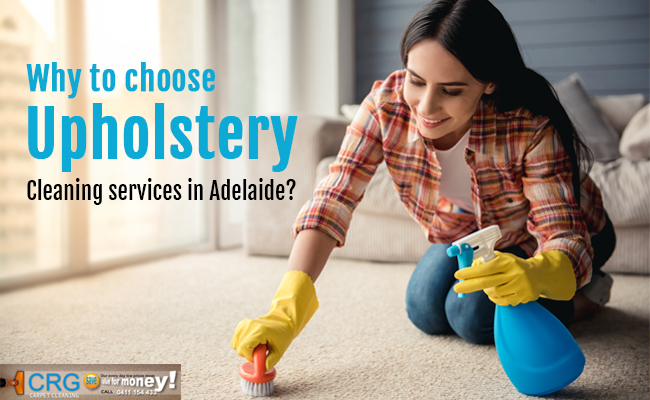 Why to choose Upholstery Cleaning services in Adelaide? Truth be told nobody wants to sit on a dirty couch, do they? It’s not rocket science but a fact. When you have clean upholstery and carpets, your home and office feel much cleaner and healthier, this is true for many of us. There something satisfying about sitting on a clean sofa or couch. On the other hand, can you imagine having a 10 years old couch lying a corner of your room and has never been cleaned? It gives you the goosebumps, doesn’t it? If you have got no time to extensively clean the house especially upholstery because of work and family commitments, professional upholstery cleaning services can help you out. Offices need to give the good first impression to its visitor and a clean environment to work in for its employees. That’s why it is important to clean upholstery on a regular basis. When you are looking to hire trusted and skilled upholstery cleaning service near you, wondering why choose CRG Carpet Cleaning? The answer may seem obvious-we are the industry’s best. But wait, there is more to it. Read on and find out exactly why you should hire our upholstery cleaning services in Adelaide? We provide the result you are looking for. With more than 15 years of experience in the industry and the team with utmost discipline and professionalism, we give our best in the work and provide the best results for you. Our team analyses the fabrics first and treat it with care using suitable chemicals and tools for the job. We know the different upholstery fabrics and their nature very well. We understand that not all fabrics are made up of the same material, and not all upholstery is made out of similar fabric. Definitely not the leather. Every fabric needs specific and special cleaning process in order to maintain its quality and prevent it from shrinking or stretching. We provide the quality you are looking for. Providing the best result is our way of doing work while maintaining the quality is our legacy. And that is what our team of experienced professionals strive for and work hard at. The best price you will ever pay. That is it, the price as low as buying a candy in a candy store. Need a place to sit and comfortably munch on the candy you just bought, or simply get back to work in a clean environment? Get us to clean the upholstery in your space both at home and at work. We charge from $6 per chair to $25 per sitting area in a lounge. These were the few reasons why you should choose our upholstery cleaning services in Adelaide. Vinegar is a lifesaver when it comes to cleaning. It can be used to remove odor and stains on fabric furnishings. Handling a fresh spillage is a troublesome job. You need to first remove the spillage thoroughly, only then the mission can commence. Spray the mixture of vinegar and clean water on to the stain but don’t make it soaking wet. Use a clean white cloth to start blotting the stain from the outer edge towards the center. Repeat it until the stain is finally removed. Carbonated water or soda water is often used to remove the stain on fabrics. We all have seen at least once on YouTube, the use of Coca-Cola- how they use it for different cleaning processes as it is pH neutral and odorless. Soda is an effective choice compared to water when it comes to tackling stubborn stains like wine and blood. Use soda instead of water to rinse and you will see the result. Mix a quarter of a cup of baking soda and a small portion of water so it forms a paste. Stir the mixture thoroughly in a bowl. Blot the spillage using a clean damp cloth and apply the paste on to the spot, leave it to sit for few hours or overnight to dry and then vacuum it off. VOILA! It’s good as new. Extra Bonus Tip – Recipe for Homemade Upholstery Cleaner. Rubbing alcohol, Vinegar (white), Spray Bottle, sponge or towel, grab all the ingredients and mix it in a spray bottle. Remember you would want to use equal parts of alcohol and vinegar. You can add drops of oil you would like for fresh smell. This is an optional step, you can skip it if you don’t want any kind of smell- good or bad. But if you do want it- a great combo for a fresh clean scent can be lavender and rosemary essential oils. Now the real usage, test it in an inconspicuous place before use. Spray the mixture generously on the fabric where the stain is and allow it to sit for 2-3 minutes. Note: Do not let it dry. Scrub vigorously with a sponge or a clean towel, only then allow it to dry, repeat if needed. If the stain still doesn’t go away, remember it’s a sign, a sign to call for professional help. And CRG Carpet Cleaning is always there for those who need us. Connect with us via phone at 0411 154 433 and we will live up to the hype. See you with all the gears! CRG Carpet CleaningCRG Carpet Cleaning BlogWhy to choose Upholstery Cleaning services in Adelaide?